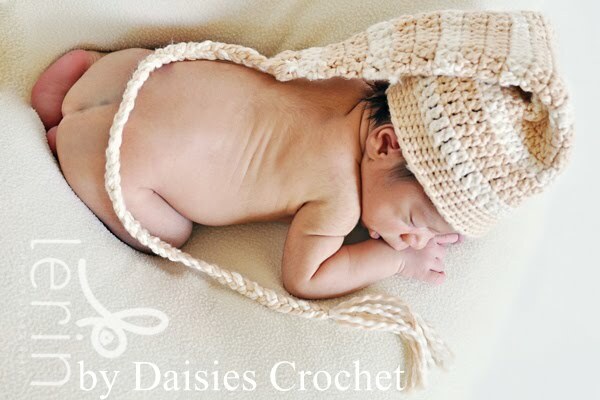 Daisies Crochet: Pattern "Elf Hat with Long Tail"
This handmade organic beanie hat is both soft and very comfortable. 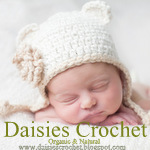 I used 100% organic cotton grown and spun without the use of pesticides, herbicides or other chemicals. This adorable elf hat is perfect photo prop for any baby picture. This item is intended to be used as photography prop only. Please do not leave baby unattended while using this item. Lion Brand Nature’s Choice Organic Cotton (103yd/94m – 3oz/85g) or any other blend of similar yardage yarn. 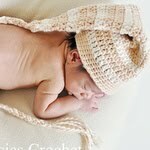 You will need 2 skeins( for 2 colors combo) or 1 (1, 2, 2) skeins for one colored hat. 4 pages, 3 photos, no diagrams. You will need knowledge of: ch - chain, sc - single crochet, dc - double crochet, sl st - slip stitch, braid, work in rounds. This pattern has been tested 4 times by different crocheters. However, please contact me if you have ANY questions. I will happily provide email support for any of my patterns. Please, no resale or distribution of this pattern allowed, and no resale of items made using this pattern is allowed. 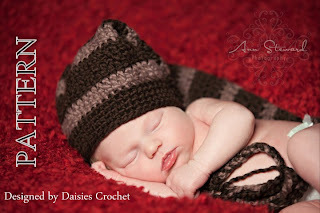 All rights to this pattern are owned by Daisies Crochet. This is for personal use only. Thank you for understanding!